Opened in 2015, the impressive Sueno Deluxe Hotel is located behind the two superb Sueno golf courses and will be sure to cater to your every need during your dream Turkish golf break. The two championship courses, the Pines and the Dunes, are very different to play but equal in quality and the island greens ensure every round is one to remember. Located in the heart of the Belek coast, Sueno Deluxe Hotel is ideally situated between the beach, golf course, and town centre. The picture of 5-star luxury, this all-inclusive resort offers a mesmerising array of leisure facilities and has direct access to the beachfront, along with its own pier. There are a number of delightful restaurants and bars on site, ensuring your utmost satisfaction is met at all times. 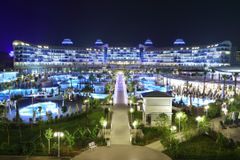 The Sueno Deluxe Hotel is Belek's newest resort having opened in April 2015. This 5* all inclusive resort is located right on the seafront with direct beach access and just seconds away from its partner, Sueno Golf Hotel, where it's two superb golf courses are positioned. With a variety of rooms on offer and 80% of them providing stunning sea views, the hotel is unique in Belek and is deluxe in every sense of the word. The rooms are filled with modern amenities that include LCD televisions, free Wifi & a fully stocked minibar. Along with the high standard rooms are the superb food and beverage choices. The main buffet restaurant has an indoor capacity of 700 and outdoor capacity of 400 and serves a huge variety of foods from across the globe. Sueno Hotel Deluxe Belek also boasts 6 A'La Carte restaurants; Italian, Mexican, Turkish, Asian and the open-air Fish & Barbecue are available to all guests all year round. Sueno square is also open throughout summer periods where guests can enjoy food from up to 16 different stations; with patisserie, a fruit stand, red meat and fowl products, salad bar, snacks, pizza, martial options, pastry & ice cream amongst the choices. An array of bars are also available including the lounge bar, the pool bar, the pier bar and the nightclub/disco bar. The hotel also boasts superb leisure facilities, with an outdoor and indoor pools and amphitheatres, adults and child’s waterparks, and the luxurious spa which includes a sauna, hay room, Turkish baths and more. With the free shuttle that operates from the reception of the hotel to the pro shop of the golf course, Sueno Hotels Deluxe Belek will cover all bases for your golfing holiday to Belek.